Glytactin RESTORE Powder Orange is a great tasting hydration beverage for the dietary management of PKU in a convenient powder packet to take on-the-go. Glytactin RESTORE LITE Powder is a great tasting hydration beverage for the dietary management of PKU in a convenient powder packet to take on-the-go. And only 65 calories per packet! Glytactin RESTORE LITE Powder is a great lower calorie formula option and contains 55% fewer calories than regular Glytactin RESTORE Powder. It comes in a delicious and refreshing orange flavor that you can mix in the volume of water to suit your taste preference. 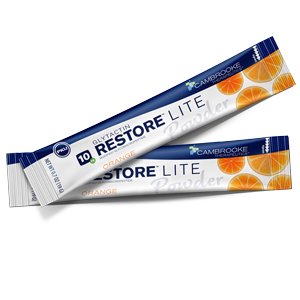 All RESTORE medical food formulas contain Glytactin, the proprietary, advanced formulation of glycomacropeptide (GMP) and essential amino acids. Awesome taste – you will not believe it is formula! Can be mixed with existing PKU formula to get the benefits of GMP. Convenient powder packet – just add water. Isotonic beverage with electrolytes and B vitamins. No artificial flavoring or coloring. Delicious and refreshing orange flavor.